Frieda Loves Bread: A Bake Sale! Who doesn't love a Bake Sale? 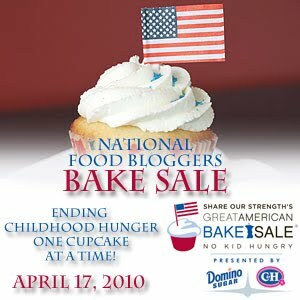 You are ALL invited to come to the National Food Bloggers Bake Sale as part of the Great American Bake Sale. Proceeds will benefit Share Our Strength, a campaign to end childhood hunger. This is a PRIME opportunity to taste your favorite blogger's goodies AND support a worthy cause! Saturday, April 17th ~ 10 A.M.- 2 P.M. Thanks for Dan's and Shirley J's for hosting the bake sales. We appreciate all their support! Becky, form Utah Loves Cupcakes, for organizing the Orem location. Friday, April 16th, Maria will be appearing on Studio 5 to discuss the bake sale ~ don't miss it! Okay, folks. You've been invited, so come on over! I'm bringing bread and rolls ~ Which breads/rolls should I make? Thank you SO much for all of your help and support. I am so excited your bread and rolls will be at the sale. I know they will be a hit! Thanks again! I can't wait to actually meet all these local food blogger's-- like YOU! Can't wait to try one of your rolls. Hat's off to all you fabulous Utah bakers for pulling this together. Such a great cause! I am not a food blogger, but I would have been happy to contribute. Maybe I can next time? Good luck, I'll try to stop by after work. Looking forward to Saturday! Together we can end child hunger! Hi! I just bought a loaf of your bread at the bake sale this morning, and it is AMAZING!! Is the recipe on your blog somewhere? I just cut into your multi-grain bread, it is wonderful. All your breads sold so well today! You are amazing. Cristie, thanks! I'm glad you liked it. Krista, Wich loaf of bread did you buy? I baked four different ones. Glad you loved it!